Professor Guenter Lewy, who as a young man had his father arrested by Nazis and then fought in the Jewish brigades later went on to write critically acclaimed books on history, such as the Catholic Church, the Native Americans, and the Vietnam War. One of his latest books discussed the Armenian Massacres in Ottoman Turkey: A Disputed Genocide, which cast doubt on the genocide conclusions that the Armenians have posited. He also wrote a book recently about Outlawing genocide denial in Europe and how troubling this was for democracy and free speech. You can use BBCode tags in the text. URLs will automatically be converted to links. Every instance heading tags will be modified to include an id attribute for anchor linking. Use [toc list: ol; title: Table of Contents; minlevel: 2; maxlevel: 3; attachments: yes;] to insert a mediawiki style collapsible table of contents. All the arguments are optional. 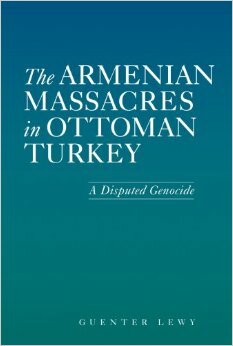 Do you believe the Ottoman Empire is guilty of an Armenian Genocide? No, the Ottoman Empire did not attempt to exterminate Armenians; they relocated Eastern Armenians to stop ARF rebellions. Yes, the Ottoman Empire decided to exterminate Armenians during World War One. Armenian Genocide - Copyright ArmenianGenocideDebate.com 2002-2015. All Rights Reserved.